This past weekend, I had the pleasure of speaking at SharePoint Saturday in New Orleans, my home town. Good times were had by all! One of the presentations that I did is called “SharePoint Designer 2010 Workflow: A Case Study”. In this session, I referred to a workflow that I had created back in the old days of SharePoint Designer 2007. I compared the old workflow interface to the new one in SharePoint Designer 2010, and talked about how the same workflow would be accomplished differently in the new version. Back in June of 2009, I put together this “Travel Request” workflow, and did a half hour recording of the process of creating it. The idea behind this recording was to compare a SharePoint Designer workflow to other 3rd party SharePoint workflow products. I created the workflow in SPD, and then Chris Geier of K2 created the same workflow using a K2 workflow product. We invited other vendors to weigh in, but they did not. Note that the 2010 presentation itself was mostly a demonstration, so the slides by themselves are probably not very useful. 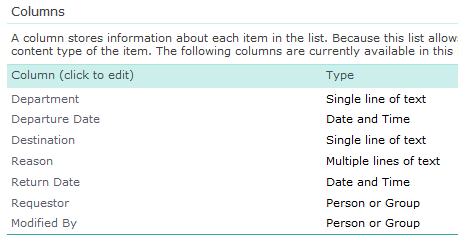 10/18/2011 Update: Due to popular demand, here are a couple of screenshots that show the columns to be created. Keep in mind that this is very simple and minimal, and you are free to add any more columns that you’d like for your own travel system. The Task list is just using the out of box Task list template, and the Approvers list is detailed in the referenced PDF of the presentation. can i send to u my questions at sharepoint 2010, and u can help me? Shawn, That makes sense that it’s behaving that way, since the workflow is running as the person who initiated it. In that case, you would either need to remove the “set content approval” out of the workflow, or install a 3rd party tool that would allow you to do additional actions like that. Also, in SharePoint 2010, there’s a new workflow functionality called an impersonation step, which you can look forward to being able to use. Laura, Great screencast. It was very easy to follow. I’m curious though, where did your edit task form come from? It’s elegantly simple compared to the stock WSS form and I’m afraid that the stock form is going to overwhelm some of my approvers. Hi laura, I Like your blog very much. but do me a fever , i want more details on Impersonation Stepusde in workflow. Their pittfals..
Scott McGlynn, The “collect data from user” task action in the workflow is what generated that simple form. Neha, Impersonation steps… you should go ahead and publish the workflow as an admin / an account that you think won’t ever go away, because if that account goes away then the workflow won’t function anymore. Hi Laura, My partner was at SPtechcon and loved your presentations. When I go to look at the screencast of the 2007 workflow, I don’t see any screencast listed am I missing something? Good Stuff Laura. My first roadblock is getting the Edit url extracted out of SP2010. Got a tip? Thanks. Hi Kelsnz, Hmmm, I don’t know, I’ve never seen that happen. In 2010, though, if you have the enterprise version, I recommend using the “start approval process” action instead of the collect data… one. For troubleshooting, I’d just make sure that the name of the department in the field in the travel request is exactly the same field type and the exact same text as the field in the approvers list that you’re trying to match to. I figured out how to extract the url from the post above. How can I give you feedback on chapter 11 of Using Microsoft® InfoPath® 2010 with Microsoft® SharePoint® 2010 Step by Step? 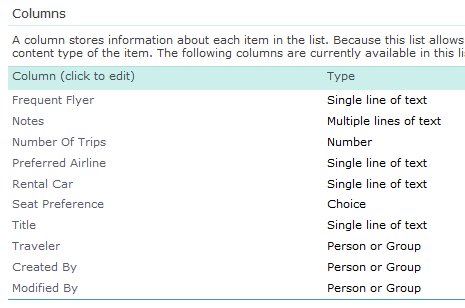 Hi Lara, can you please include the steps to create the lists and fields for this travel request form? It assumes that they have already been created. Hi Lara, i am new for sharepoint please provide me Travel Request template. so i can start This. Hi Laura, Just an update to my query above. I managed to work out what the issue was – I was trying to add a URL in the e-mail to the Edit Item Form for the Dept Approval Task that was being created but had this “E-mail” Action happening before the “Collect Data from User Action”. My problem is now that if I move the E-mail Action after the Collect Data from User Action, then the e-mail does not get sent until the Approval has been completed but my e-mail contains the link for the user to approve. I tried running in Parallel but the variable still wasn’t populated. Any ideas..? I have played around with the “Set Workflow Variable” to try and set the DeptTaskID but of course this cannot be done before as the actual task has not been created yet. Kelly, Please let me know what page of the PDF you’re stuck on, I can’t figure out what you’re referring to. The email to the new traveller is supposed to go before the approval process starts, and the travelers editform link gets the variable in it for the ID, which is on page 3.